Surprise! Content marketing generates profit. You’ve probably heard the term “content marketing” thrown around in the business world lately. It’s been the talk of many discussions. From SEO and social media to leads and sales, content marketing is starting to dominate the conversation. Business owners, marketers and managers are looking at content marketing and wondering if it’s something their businesses should invest in or if it’s just another passing fad. Here are a few reasons content marketing is important. You may not have seen these yet. Blogging is just one aspect of content marketing. Video, social media, eBooks and guides are a few other examples. Businesses are investing in all areas including blogging. You probably recognize some of the big names on the list of companies that blog – John Deere, Red Bull, Coca-Cola, Nike, ExxonMobile and many others. And it’s not just large companies. Small companies may have more to gain from blogging. Does that seem high? That’s a stat from the Content Marketing Institute. The numbers are probably a bit skewed, but it’s still an impressive number of businesses that are investing in content marketing. 3. $20+ Million In Sales. ~$1 Million Marketing Expenses. Those are the numbers for Moz in 2012. That is some pretty good return on an investing that includes building content and promoting it over a few years. It’s not only large businesses benefiting from content. 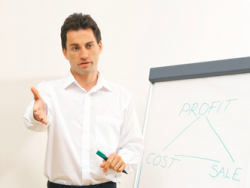 Small businesses like this consultant can generate sales and profit. For this consultant, the blog generates 70% of all business. @DayneShuda Blog – I ask every CEO who hires me why they hired me. 70% of the time, they say they've read my blog for the past 2 years. Without content marketing the site you’re reading now would lose at least 53% of its current traffic. HubSpot has great statistics. One from a few years ago found that businesses that blog generate 55% more traffic. The more content you create that your target audience finds interesting the more traffic you generate and the more sales you bring into your business with new customer acquisition. You think there is SEO magic out there that can bring in tons of traffic to your website? There is only so much you can do and most SEO agencies only offer short-term strategies. Investing in content is the ultimate SEO strategy. It increased SEO traffic for this business by 93% in five months. Not only does content marketing generate traffic, it also brings in lower cost leads. This means more profit. Entrepreneurs care about sales and profit. It’s really the only thing that matters when it comes to business. There is a lot of information out there about content marketing. Many of it doesn’t discuss sales and profit. Hopefully the information in this post will help you with your content marketing strategy.